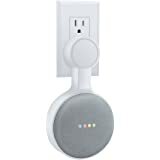 The newest and cleanest member of the Dot Genie line of outlet mounts and the first and best for the Google Home Mini. Visibility and sound is improved - see and speak to your voice assistant from anywhere in the room! 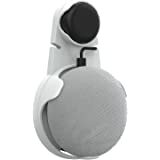 Dot Genie created a patented custom plug with a "dummy ground" for strength that attaches to The Mini Backpack and holds your Mini tightly in place in every possible outlet configuration with the least clutter. The best wall mount! 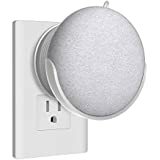 Even works on ceiling outlets! The Mini Back Pack by Mount Genie installs in seconds and works with VERTICAL and HORIZONTAL outlets and does not block the second plug. The compact design allows for easy movement from room to room and great to take on trips! Because of the custom plug, no silly cord wrapping is required during installation. The Mini Back Pack is the first and best mounting solution for the Home Mini. 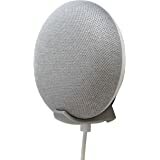 The Mini Back Pack builds on our long history of cord-cutting mounts and was created with the help of engineers and fashion designers to produce the simplest and most elegant mount/plug that puts your voice assistant anywhere but keeps it from being a corded eyesore. 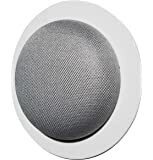 The patented custom plug was designed to hold your voice assistant in every configuration with extra snug fit and can even be used on ceiling outlets adding another dimension to where you install your device. The Mini Back Pack is your simple answer to the cleanest Home Mini installation. Great idea - works well. There's a couple complaints though... 1 - The cord provided is too short. Just touching the cord that is stressed and at a slight angle often reboots our Mini. Normally this wouldn't be a problem except this is plugged into the outlet beside a switch so it can get touched. We even had it reboot once just by turning the light switch off next to it. The stress that the cord is putting on the micro usb port concerns me. I have had phones and tablets that have had the micro usb port wear out with a lot less stress on them. 2. The description says "The Mini Back Pack by Dot Genie installs in seconds and works with VERTICAL and HORIZONTAL outlets and does not block the second plug." Unless you have just a small plug going in below it, it does pretty much block it. We haven't found anything we use in the bathroom (razor charger, hair dryer, toothbrush charger, nightlight) that can plug in at the same time. Other than those issues - this is perfect. 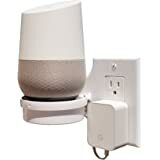 5.0 out of 5 starsGreat mount that secures your Google Home well. We love this mount for our kitchen where the outlets are high off the floor. I don't think we'd use it anywhere else where the outlets are like a foot off the floor. It seems that would be an odd placement. And with toddlers running around, that wouldn't be ideal. But in our kitchen, where it is where we probably spend the most time, it is perfect. 1. No need to hide or place wires strategically. 2. This mount still allows you to use the second outlet. 3. 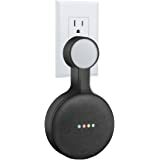 Keeps the device off a surface like our kitchen counter where spills do occur. 4. It seems like it is well made. 5. It holds the device really well & securely. You need a flat-head to pry the device off carefully. 1.0 out of 5 starsHigh failure rate! Not returnable! Item arrived with dead power block. Upon trying to exchange I found that they don’t allow returns. Now reaching out to Amazon to see if they will make it right. Update: Amazon made it right and issued a refund. They told me not to worry about sending it back do I decided to open the power block and found that one of the wires had a bad solder point. The wire to the plug wasn’t even connected. I love this thing. I'm actually here buying my second one to have in our bathroom by the sink. 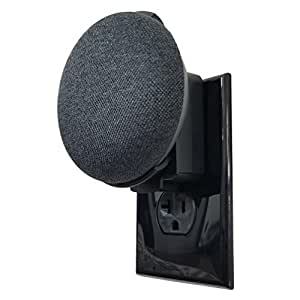 The use case for this item is unique only because for most rooms with outlets near the floor this wouldn't be a good choice. But for kitchens, bathrooms, and the like where the outlet is above the counter surface this is ideal. Mini fits like a glove, and stays out of the way! My first use is in my basement where there are outlets up high that I believe were intended for bar lights, and as you can see in the pic is far better than either having the cord high, or low on the wall and Mini on the rail. Perfect! *EDIT* Ok, so I bought a THIRD mount because we got another Mini as a promotional giveaway, and I stand by everything I said above, and want to give the seller Mount Genie serious props for stepping in when we had a little hiccup in the order process. They were on top of it the whole way, and made sure I was happy. I think we've got a device in every stinking room now, so we won't be buying more, but if you're on the fence, this is they one to get! 3.0 out of 5 starsGood idea, bad product testing.. Received my wall mount, but when I first hooked it up, nothing happened when I plugged it in. Finally I realized it was the USB cable when I tried another cable (luckily I had an extra one that fit into that tiny slot), and my Google Home Mini came to life when I plugged it in! I'd like to get another for my kitchen/living room, but a bit iffy on getting another one, if I got another faulty USB cable or worse! They really need to check to make sure they work before sending them out! If I could get a replacement cable, I'd give it a 5 star, but this kinda soured the experience. Had I not had a cable (that fits) laying around, id be screwed! Either way, my current setup isn't pretty, but it works! Nice to not have it on my desk or night stand in my room..